Happy Father's Day. 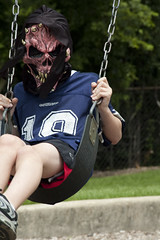 I am sharing another mask shot as I felt a kid was appropriate on a day that celebrates fathers. I'll get back to flowers and stuff tomorrow. For now, have a fantastic Father's Day!! !